Print: 9 x 7 x.5 inches, With Display Base: 9.5 x 7.75 x 2 inches. 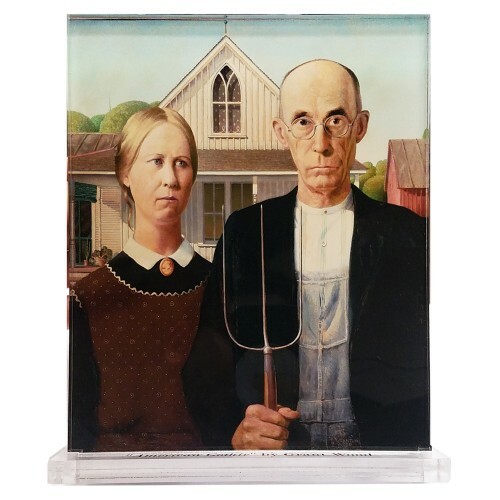 Our clear acrylic display of Grant Wood -- American Gothic. All acrylic displays come in two pieces: a printed base with the artists name and title of their famous painting, and printed artwork on half inch clear acrylic. Items are printed and produced to order. Printing and processing takes up to 5 business days plus shipping time to your location. 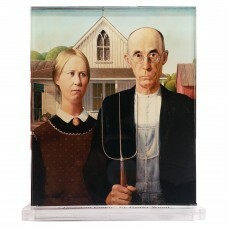 Masters Behind the Glass are NOT printed on glass but gives the illusion of glass.American Gothic is a painting by Grant Wood in the collection of the Art Institute of Chicago. Wood's inspiration came in his decision to paint what is known as the American Gothic House along with "the kind of people I fancied should live in that house." He painted it in 1930, depicting a farmer standing beside a woman who has been interpreted to be his daughter or his wife. The figures were modeled by Wood's sister Nan Wood Graham and their dentist Dr. Byron McKeeby.